Our family owned business is a haven for ice cream lovers! We bring you truly exceptional homemade ice cream served in a fun, friendly atmosphere. Each batch of artisanal ice cream is made right in our Midland store using Hand-selected ingredients from the Great Lakes Region. From Wholesome favorites to exotic new flavors! Available in Midland location only. Our ice cream cakes are made in-house. We keep a variety of cakes in-stock at all times. We do not take orders for custom cakes, but you can call and reserve an in-stock cake at any time. Cookie Dough Ice Cream on a brownie base topped off with white Vanilla frosting, whipped cream, fudge, peanuts and cherries. Cookies n' Cream ice cream with vanilla or chocolate frosting, cookie crumbs and Oreo resting atop mountains of whipped cream. Brownie Base. 6" $19.99 / 9" $34.99. Cooke Dough Ice Cream with vanilla or chocolate frosting, whipped cream covered in fudge, caramel and chewy baked brownie pieces. Brownie Base. Our cake flavor of the month is cake batter. A sweet and smooth cake batter based ice cream with sprinkles mixed throughout. These cakes come with either vanilla or chocolate frosting and all come with a brownie base with sprinkles on top. Great Lakes Ice Cream makes dozens of unique and popular flavors available for your ice cream shop. If you are looking for fast-moving ice cream products for your store, then look no further. We offer top selling flavors year 'round and changing seasonal favorites like peppermint stick and pumpkin pie. Best suited for high-volume cafeterias, our 1/2 pint cups provide a great value for your customer and over 50% margin for your business at MSRP. Standard popular flavors are available throughout the year with seasonal flavors changing regularly. Great Lakes Ice Cream Company offers a wide range of catering options to fit your needs. From as little as 30 servings to as much as 1000 or more, we can help you host a unique and memorable gathering. We have available for you a fleet of cute ice cream carts. Our Superior Cart Party includes rental of one ice cream cart, 120 cups of ice cream, spoons and free delivery and pickup in the City of Midland ($50 delivery fee outside of Midland). Flavors are purchased in quantities of 30, so you can choose up to four flavors. Additional cups $2.00 each in quantities of 30. Flavors available year 'round are: Blue Moon, Chocolate, Strawberry Sorbet, Raspberry Rage, Cookies n' Cream, Wake up Call (coffee), Vanilla Vice. Seasonal flavors change regularly, so call us for more info. The party in a box for just $39.99! Everything is pre-packed and ready to go. A very easy and affordable option for medium sized gatherings. Additional cups are $2.00. 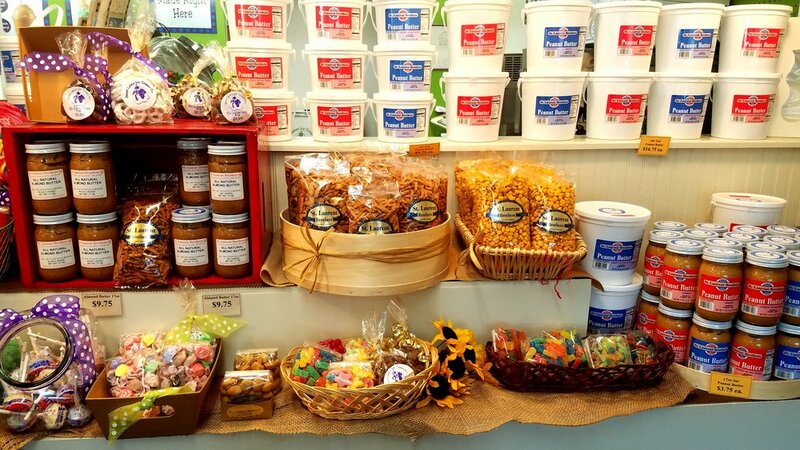 Great Lakes Ice Cream Company caries a wide selection of locally roasted nuts and homemade candies from the local hundred year old nut house St. Laurent Brothers. Natural Peanut butter, nut clusters, hand-dipped chocolates and classic candies are among the variety of tasty treats available through December. From October through December, Great Lakes Ice Cream Company offers full customization for Party Trays and Gift tins. You select up to seven fine candies and nuts to fill up your party tray, or choose a festive gift tin to give to friends and family. Gift tins are available in a variety of sizes and designs to fit your need. Talk with our trained staff and get a few samples to decide what goodies best fit your needs. Gift wrapping available.